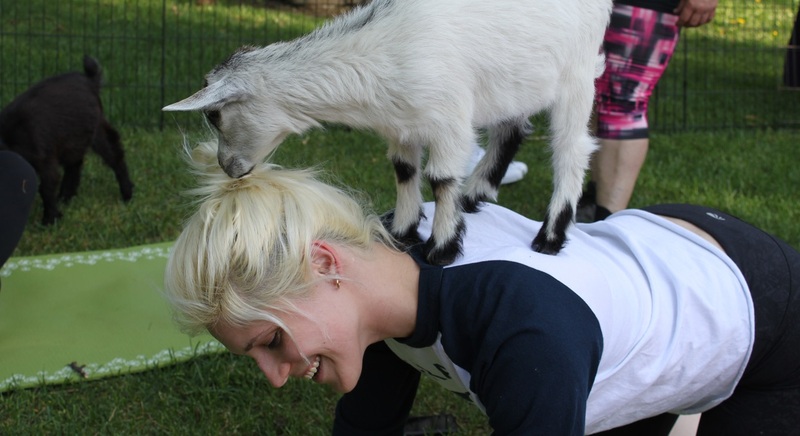 SPOILER WARNING: This blog post is about goat yoga. It contains significant quantities of goat cuteness, and very little about the health and wellness benefits of yoga. Consider yourself warned. So for the last few months, I’ve been hearing about the whole goat yoga phenomenon. Suddenly it’s everywhere: here, for example. And here. Also here. Oh, and here too. And … well, you get the drift. At first I thought it was a joke. I mean, seriously? Trying to master your Tree Pose with goats frolicking about? How could that possibly be relaxing? 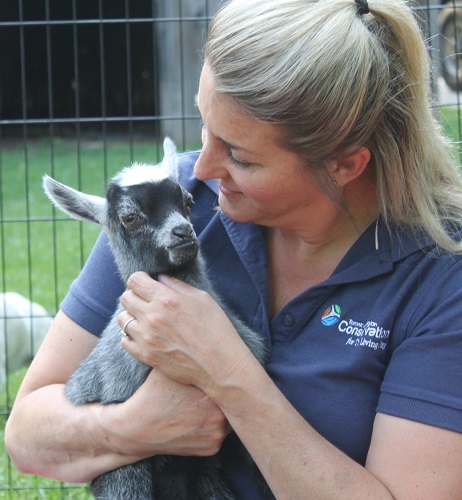 Last week, I decided to shelve my skepticism and check out an evening of goat yoga at Black Creek Pioneer Village — part of the Nightlife program of activities introduced last year at the Village. On arrival I met instructor Melina Morsch of Fox Den Yoga, along with Tricia Simons of Triple C Farms, both of whom greeted me with promises of a great time. The first thing you notice: the goats are everywhere. All are females and kids. They scamper around underfoot, nibbling on the grass; occasionally one of the little ones will try to sneak a quick drink from Momma. The second thing you notice: the goats are totally running the show. Humans are not in charge here. 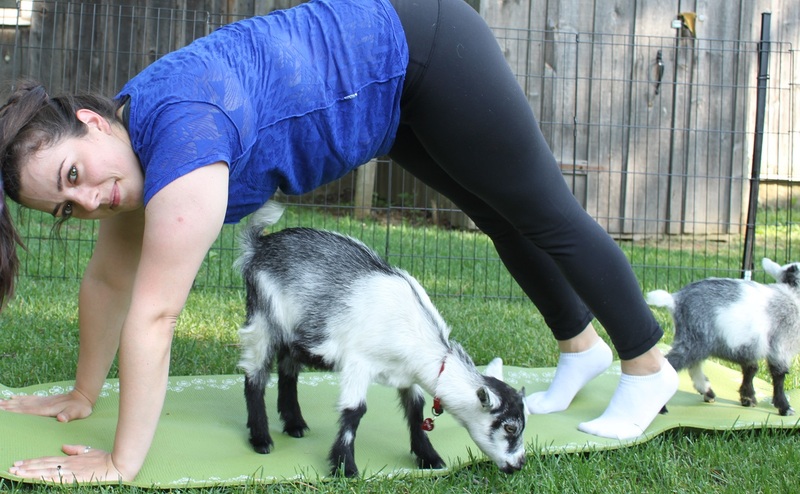 You just have to find a spot for your mat and sort of … work around the goats. A consumer advisory regarding hygiene: goats are not litter trained. They do their business wherever they see fit. If that doesn’t sit comfortably with you, then you probably want to stick with traditional goat-free yoga. To their credit, the Triple C folks do a great job of managing the whole issue: if a goat leaves a little gift on your mat, they’ll get you a clean mat pronto. Once the 45-minute session begins, it’s pretty much like any other yoga class – with the exception that not a lot of yoga gets practiced. As Milena explained, it’s not about achieving your perfect Cobra Pose; it’s just about being there in the moment with these delightful creatures. The more you can bring your energy in sync with theirs, the more eager they’ll be to come hang with you. At one point, as I watched, two kids wandered over to visit a mother and daughter working out nearby. So calm and comfortable were these youngsters that they soon fell fast asleep — one in the arms of the mom, the other on the mat in front of the daughter. The author (right) and friend. So did I actually get any yoga in? Not much. And I didn’t mind a bit. It’s entrancing just to be around such sweet-natured beasts. Their simple presence is calming — and that, coming from a recovering Type A personality, is high praise indeed. As the class drew to a close, I found myself breathing more deeply, leaving the stress of the day behind. Well done, goat friends. 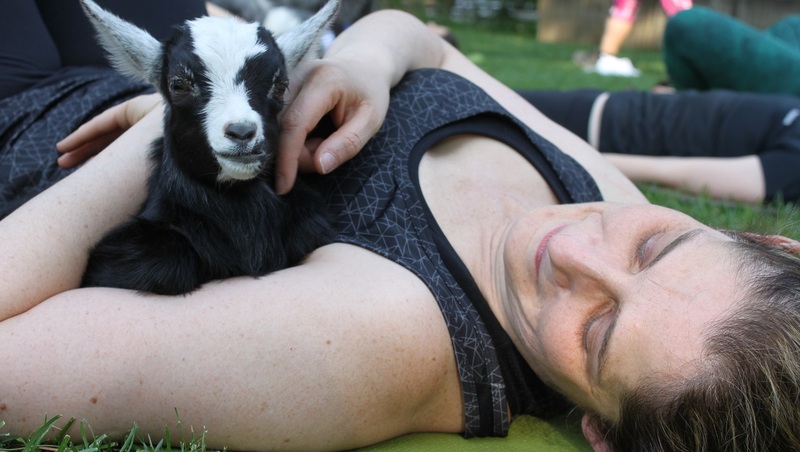 Goat yoga happens on Thursday nights at Black Creek all summer long. Visit Fox Den Yoga online and select “Events” to book a session. PreviousNightlife Returns to the Village!